Hayward City Manager Kelly McAdoo didn’t want the City Council to ask many questions Tuesday night after they learned about the fiscal health of the city. Save it for when the council meets for an in-depth discussion on May 20, she urged. But, all the council needed to know was one revealing fact: Hayward’s budget deficit for the next fiscal year is $10.4 million. McAdoo’s $157 million general fund budget projections delivered some further sobering news, which includes more than $108 million in unfunded liabilities related to retirement benefits and the specter of Hayward’s general fund running the risk of depletion in three years. And while increases in property tax revenues alleviated some pressure on the city budget, sales tax revenues are estimated to be flat in comparison to a year ago, said McAdoo. “While the City has taken significant steps towards attaining fiscal sustainability over the last five years, much work remains and we continue to struggle with a structural budget gap driven by increasing costs of operations, primarily relating to the rising costs of labor,” McAdoo wrote in the budget message to the council. During Tuesday night’s limited discussion, McAdoo labeled it a “status quo budget,” and indicated the $10.4 million funding gap would be filled with general fund money. That is, unless the the City Council, through a series of pubic budget discussions over then two months, chooses to make cuts, she added. Hayward’s general fund, however, would be whittled down to just $11.2 million, if used to reconcile the 2018 budget gap. In addition, the general fund would fall to a projected 10 percent of its overall expenditures, which is far below the 20 percent benchmark within the City Council’s policy. Last year, the council allocated $4.4 million to close the previous deficit. “This is incredibly concerning to staff,” said a member of the city staff. A combination of rising public employee benefit costs and the decision by CalPERS earlier this year to lower its discount fund to seven percent is further squeezing the city’s treasury, said McAdoo. Total retirement costs are projected to increase by 11 percent, and it could get worse. “Unfortunately, CalPERS is likely not done with these types of changes that will make it harder for cities, including Hayward, to fund ongoing operations and services to the communities we serve,” she said. The proposed budget, though, recommends making only a $3.9 million minimum contribution to CalPERS next year. The city’s 657-member workforce, though, is proposed to increase by more than six full-time equivalent employees. 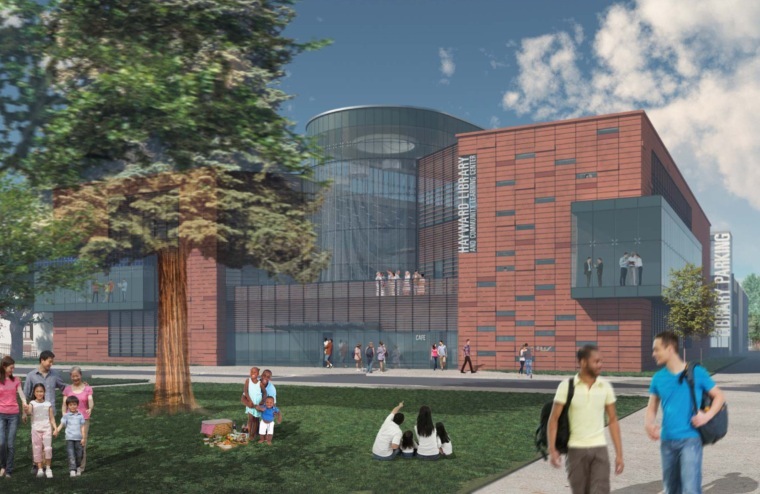 The additions are primarily related to staffing the new 21st Century Library and Community Learning Center, due to open downtown near Hayward City Hall. Hayward Councilmember Al Mendall said he was “bummed” by the prospects of dealing with another year of double-digit deficits. “I thought this was behind us,” he said, although he also expressed optimism that the council experience in budget matters will again balance the budget equitably. Overall, the City Council appeared to take the budget projection in stride. Hayward Councilmember Mark Salinas reiterated comments made by McAdoo crediting city employee groups, many of which agreed to bear more of the costs of their benefits over the years. “The budget is in good shape because of our employees,” he said. A special budget work session is scheduled for Saturday morning, May 20, at City Hall. Hayward city departments will make budget presentations and the council may begin offering its solutions for balancing the budget before the state deadline of June 30. Posted in Al Mendall, Barbara Halliday, budget, budget deficit, CalPERS, Francisco Zermeno, Hayward, Hayward City Council, Kelly McAdoo, Mark Salinas, property tax, sales tax, unfunded liabilities. Bookmark the permalink. These people are crazy. They are not paying attention. Looking to survive only the next year, they are missing the notice that the retirement fund is going to continue to be a mess due to declining interest rates and people paying into the fund. This has to be settled before the city will be solvent. A 90 million dollar library, 19 million dollars to coat some of the city streets black. Raising taxes to pay for the new library, Measure C tax to pay for cops, street workers, public work projects and street signs to let people know what Measure C taxes are paying for. Spend, soend, soend and cry broke later on. Fran David's specter still looms over city hall. Only I thought Hayward was going to go bankrupt in 2018. Time to make the colorful charts with brightly colored financial cliffs and tamp down revenue. Like the 2.5 million dollars in sales tax revenue brought in to the city coffers by businesses and car dealerships on Mission. Hard to believe that city council wanted those town homes and hotel downtown. As though the 476 unit Lincoln Landing apartments/shopping center and the Mission View town homes and hotel project could exist so closey. As if the Loop would be able to handle all that traffic. Boneheaded concept at best! Clueless council. I will make just a few comments. One, if Hayward is paying its firefighters as much, or even almost as much, in salaries and pensions as at least most other Bay area communities, then it should get that particular item under control. Two, especially in the last few years government has gone totally nuts in what it is trying to do. For instance, it first started trying to replace the family and the parents by having school meal programs. Then it kept on expanding the school meal programs to the point that finally it was even sending food home on the weekends and during the summer. Government will never have enough money to do everything fully and/or properly, and especially replacing the family and the parents. So government, and including in Hayward, should decide what is most important, and concentrate on that, and rather than trying to do everything and spending money on everything,, and including replacing parents and the family. Mendall provides proof that council doesn't even pay attention to Staff's predictions of bankruptcy every four years. City council has gotten to the point that even they have trouble believing their own lies. Why waste money on consultants and 10 year budgets if you constantly predict financial ruin? I would hand out free food to city council so they can have lunch at their next meeting, but I don't want to be fined for it. Nice to know that Mayor Halliday can make light of people who really can't afford to feed themselves and their families. Mayor “Let Them Eat Cake” Halliday should take a moment to think before she speaks. Time for a new mayor. One with class enough not to make fun of the poor folks in Hayward. Respect your residents and your workers for a change city council. Fran David is still running Hayward even after they put her head in a jar of formaldehyde. Halliday hates the less fortunate except when the less fortunate tells her their problems in a public setting. Very Trumpian of McAdoo and Salinas to praise city workers for helping with the budget after forcing them do so by fiat. I think city council and the real powers that be may not realize that everyone now knows their motivational tool to get city employees to give back. Unfair Labor Practices and threats of layoffs. Maybe it slipped Salinas' mind. Mark Salinas, try googling “Hayward City Employees Strike” or “Hayward Cty Employee Sue For Unfair Labor Practices.” Then reflect on how fake your “thank you's” are. Those who fail to remember the past, are doomed to repeat it. I don't think many people know Salinas uses child labor to run his Pancake Breakfasts. Beware the sausage is made from with the mangled fingers of latino boys and girls. Salinas is a bubble boy. He doesn't listen or read. Not a good sign for being an “educator” by trade. If he is the best that “Education City” has to offer, we are all on trouble. Because of his windbag stories, council meetings now run past 10:30 p.m./11:30 p.m. Funny how city council called out the School Board for having long, unstructured meetings where people had to stay late to address them. In doing what they condemned they realized the public speakers end up leaving and not having their say. How about pay cuts for council, layoffs, (because we have 7 of them) increase their burden of paying more for their PERS and health plan benefits, vision and dental. Also, they can brown bag lunch for their meetings or buy their own fastfood lunches like the working stiffs do. The term “There's no such thing as a free lunch” does not apply to city council. As a taxpayer I've been footing the bill for “forever” council muppet puppets like Barbara & Marvin. Even Sweeney knew when it was time to go. City council is getting to be more expensive and high maintenance. I love this comment. You are so right! What about Sarah Lamin shaking her head “NO” every time Jim Drake talks about the councils' over spending? Is she a fool? Does she read the budget? The ignorant people of Hayward voted 20 more years of taxation on utilities and the council still over spends. VOTE THEM OUT OR IMPEACH. Marvin P. is the only one of them that can add. They just gave the city manager a home loan through the general fund at 1%. I am really angery about that and Mark Salinis commented, he wanted other city workers to get home loans through the general fund at low interest rates.He should be the first to go. Our city manager makes over $320,000 a year. She makes more money than anyone in the city. She can go to a bank and get a loan!